Researchers have revealed what actually lies under the western parts of the icy continent of Antarctica. There is a hidden world under Antarctica, in a new study, researchers have shown giant ‘wetlands’ 800 metres beneath the Ice in western Antarctica. Thanks to the Whillans Ice Stream Subglacial Access Research Drilling (WISSARD) project financed by the National Science Foundation (NSF) researchers are one step closer to discovering exactly what lies beneath the thick ice sheets covering most parts of the icy continent. Researchers hope that further studies will allow them to understand how sea levels rise, and how ice behaves in response to global warming. 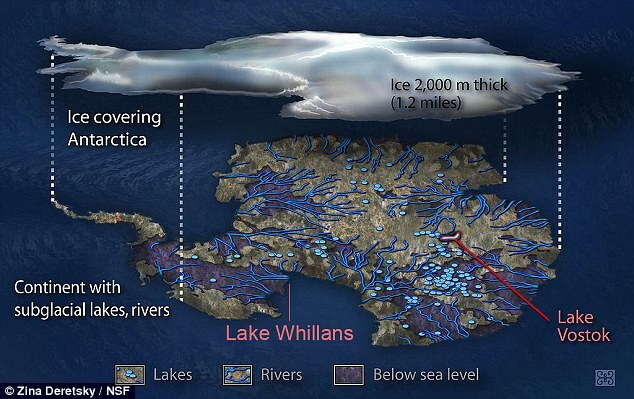 Researchers now know that Subglacial Lake Shillans is fed by ice ad contains small amounts of seawater from ancient marine sediments which can be found on the seabed of the lake. The water of the lake periodically drains to the ocean through some channels connecting the lake, however, with insufficient energy to carry much sediment. Three separate papers analyzed the studies obtained in January of 2013, when the WISSARD project managed to successfully drill through the ice sheet reaching Subglacial Lake Whillan, retrieving water and sediment samples from a body of water that had remained in isolation from direct contact with Earths Atmosphere for thousands of years. Two of the most interesting papers were those published in Geology and the journal Earth and Planetary Science Letters. According to lead author Alexander Michaud, of Montana State University, they used data taken from a 38-centimeter (15-inch) long core of lake sediment to characterize the water chemistry of the subglacial lake and its sediments. They discovered that lake water primarily originates from melting at the base of the ice sheet covering the subglacial lake and that there was a minor contribution from seawater, trapped in the sediments under the ice during the last interglacial period, a time when the Antarctic ice sheet eventually retreated. Scientists have found that the ancient, isolated reservoir of ocean water has the ability to affect the biogeochemistry of this lake system. The second paper published in the journal Earth and Planetary Science Letters, lead author Timothy Hodson of Northern Illinois University and his colleagues looked at core sediments taken fro the lake in hopes of discovering more about the relationship of the ice sheet, subglacial hydrology, and underlying sediments. Their discoveries show that while numerous floods pass through the lake every once in a while, the flow of the floods lacks energy in order to erode extensive drainage channels. Researchers concluded that that the environment beneath the Icy continent is very similar to a wetland within the coastal plain on other parts of the planet. What we have to understand is that around 170 million years ago, Antarctica was part of the supercontinent called Gondwana. Around 25 million years ago, Antarctica as we know it, gradually broke apart from Gondwana. According to research, Antarctica was not always cold, dry, and covered in ice sheets. Au contraire, during its long history, Antarctica was located farther north and experienced a tropical or temperate climate, meaning that it was covered in forests, and inhabited by various ancient life forms. Russia Spills the Beans: Antarctica, It’s Not What We’re Being Told! Will This be the Real Jurassic Park? Team Plans Scientific Expedition To Antarctica To ‘Prove’ The Earth Is Flat!